Scholl have designed and developed tights that are here to help those who suffer from tired, heavy legs especially when on the legs non stop daily, for some it can just be up to 5 hours, I remember working on a counter and never being able to sit down, the legs would ache and sometimes feel as if they cannot move. 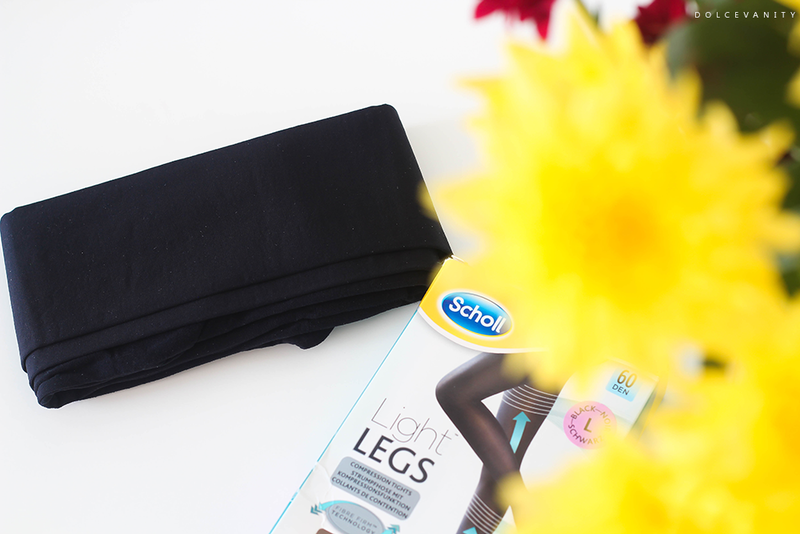 Scholl Light Legs Compression tights work by helping to boost circulation with targeted pressure from the ankle upwards. Michael Harrison-Blount, expert podiatrist explains the benefits "The highest level of compression should start at the ankle, which moves blood from the foot and ankle into the calf. Intermediate compression should then be applied at the calf to move blood up the leg and into the thigh. Finally, lowest compression should be at the thigh to keep the blood moving towards the heart." The tights are a 60 denier (the denier is the unit weight used to determining the fineness or thickness, the lower the more fragile and sheer) they're fully opaque and black in colour but although getting up there in thickness they're extremely breathable. My nan suffers from really bad swelling on the ankles, which can make standing and walking when she's out, slightly painful so I thought, okay perfect guinea pig. The first wear, it was experienced that they are tight putting them on before - probably better to stretch them out a few times before wear - but the card included does state that you need to gather the tights to the toes with your thumb and bring it over your toes and feet for a more easier fitting (but be sure you've got no snagging nails or jewellry on). Once on, they fit nicely, give a slender silhouette to the legs, no gathering at the ankles (there are no Nora Batty tights with these - last of the summer wine reference!). On the thigh they're more sheer than below the knees, I guess this is down to the compression and how they've designed the tights. These also go all the way up to underneath the breasts - keep in mind my nana is about 5'2 - but there's a lot of stretch and compression & it doesn't compromise in comfortability. When normally on a day out of walking, give or take about 5 hours where her ankles would already swell up, her legs and feet will feel tired by the time she's reached home and there was none of that, which she was extremely impressed and pleased by. They were easier to take off than put on the first time, when I asked her, her exact response was 'Yeah mon!' LMAO, so I definitely knew, she was impressed. Now with the cold days setting in, I'm definitely getting some to keep my knees warm that get very bothered in winter. At £14.99 they're extra resistant to tears and ladders thanks to unique Fibre Firm technology and each pair can last up to 100 washes without losing shape or compression, £15 isn't bad at all if you get a lot of wears and benefits from them. Would these be something you'd think about wearing? Anything that guarantees no ankle-bagging is great by me - loved the Nora Batty reference! Haha! Yes I think I'm going to have to get myself another pair because I suffer from bad knees in the winter and it's getting very cold now. 100 washes! Can't beat that! Still going over a month or so later with no tears or ladders! I definitely remember working at a counter and wishing I had some of these when I was at uni. I still think these would be great for when you're out all day and know your legs will kill you afterwards. These could be helpful, should look into them a bit more and I hope once they're sorted you'll feel so much better. I love the sound of these, something I would try for myself for sure. May have to keep my eyes out for them. Ah good, beneficial for those long, running up and down days which are nearly every day. Very interesting tights, I wear black tights on a daily basis! Keep these in mind if you want a new pair with some added benefits. I definitely need some of these, as I seem to made ladders in my tights in an instant. Eeeek yes you still don't want to encourage them with these with sharp nails / jewellery but being more resistant means last longer. Bless your nan, that is hilarious. I like to wear dresses all year around so will be investing in a pair of these. Haha thank you lovely. Yes well you always look amazing these would be great for you. Yes! Grab some of these and add them to your fabulous wardrobe lol. 100 washes founds fab. I think I need this in my life. Haha, I know right - that's a lot of washes for tights. I seriously love the idea of these tights. I need to get a few pairs for myself! Me too! They're very beneficial, thick and warm but they don't look thick! These sound interesting, definitely worth trying if you are on your feet all day. For sure, that aching leg syndrome isn't nice. These sound really good, I might have to grab some and try them the next time I wear a dress out. Yes as chilly as it is now too it'll be a good thing! What an innovative product! Need to try these out for myself to see if they help. For sure, I agree. It's such a good thing and it seems to helped quite a few people. I must admit I hate wearing tights on the whole - but I can totally see the benefit of these and could be tempted into trying them. They do seem a little expensive though. For some they can be - I agree, I think the price is justified by how long they last and what they're used for. As I guess they're more 'medical'.